Easy stuffed shells recipe with spinach and three kinds of cheese! Ricotta, parmesan, and mozzarella pair nicely with a homemade sausage marinara sauce. A delicious Italian feast the whole family will enjoy! Pasta and cheese meals are always a big hit at our house. Unlike a classic lasagna with multiple layers of noodles, cheese, and sauce, this recipe calls for pasta shaped like giant seashells. 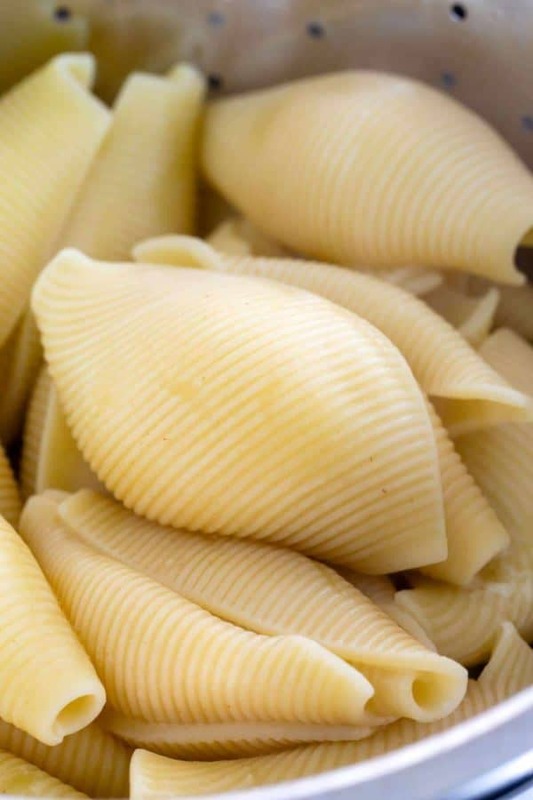 The process is actually easier since the ricotta mixture is piped straight into the pasta shells, which also makes it easier to serve individual portions. Making a homemade marinara sauce is fairly easy. Simmering crushed tomatoes with Italian sausage quickly builds up the flavor in just 20 minutes. The stuffed shells get nested right into the sauce then bake until the cheese is melted and tomatoes are bubbling. A wonderful meal that can be made ahead of time or frozen and reheated for a fast dinner any day of the week. Cook sausage for the meat sauce. Simmer sausage in tomato sauce. Spread tomato sauce in a baking dish. Boil the pasta shells until tender. Add cheese filling into a plastic bag. Pipe cheese into shells and add to baking dish. Bake uncovered for 5 minutes until sauce is hot. Dried jumbo shells are the best for this recipe. Make sure to cook them until al dente. They should be tender but not overcooked so they don’t fall apart when you fill them with cheese. I always cook a few extra shells because some may break when boiling. What’s the difference between manicotti and stuffed shells? Manicotti are flat tube-shaped pasta noodles versus round shell-shaped. Overall the two Italian pasta casseroles can be filled with the same ingredients. It comes down to your preference for presentation. How do you make a quick marinara sauce? If you don’t have vine-ripened tomatoes on hand, use tomato paste and crushed canned tomatoes that are already concentrated in flavor and picked at their peak season. San Marzano tomatoes are my top choice. Simmer the tomatoes with the sauce along with some chopped onions, garlic, oregano, and mild Italian sausage. If you like a spicier sauce, add red pepper flakes or use a hotter variety of sausage. What filling do you use for stuffed shells? The base filling is a combination of whole milk ricotta for the creamiest texture, shredded mozzarella, and parmesan cheese, plus one egg. For this recipe, I enhanced the neutral cheese flavor with garlic, salt, pepper, nutmeg, basil, and parsley. I wanted to add some vegetables to the dish, so I also chopped sauteed spinach. It’s important to cook the greens to remove excess moisture before adding to the filling to prevent it from becoming watery. Kale and swiss chard are excellent healthy alternatives to the spinach. What’s the easiest way to stuff pasta shells? Add ricotta mixture to a piping bag used for baking. A large plastic Ziploc bag with a 1-inch long opening cut from one of the corners works nicely too. A large spoon is a fallback option. Use gentle pressure to fill each shell. To organize the process, I place each newly-filled shell on a sheet pan first before transferring them to the baking dish with sauce. The best part of the meal is that it can be assembled ahead of time. The entire recipe can be made up until the point of baking the pasta. Tightly cover the uncooked stuffed shells and sauce with foil, and refrigerate for up to 3 days. Then you can add it directly to the oven and cook until the shells and sauce are hot. Yes! Fill each shell with cheese then individually cover with plastic wrap. Place on a small sheet tray and allow to solidify. Once the shells are frozen you can transfer them into a resealable plastic bag for long term storage. This allows you to prepare as many servings as you’d like. Transfer frozen shells to a baking dish with the sauce. Bake at 400°F (204ºC) and then check that the shells are hot after 30 minutes, adding on additional time as needed. You can also reheat a few shells in a microwave-safe dish, covered with plastic wrap, and cook in 30 seconds increments until warmed through. Top with sauce, pair with garlic bread, and you’ve got a quick dinner! Simmering the tomato sauce concentrates flavors by allowing some of the liquid to evaporate. The natural acids in the tomatoes (predominately malic and citric acid) helps to tenderize the meat. Use vine-ripened canned tomatoes because they contain a lower amount of acid. This makes the taste of the tomatoes sweeter and has a more balanced flavor. 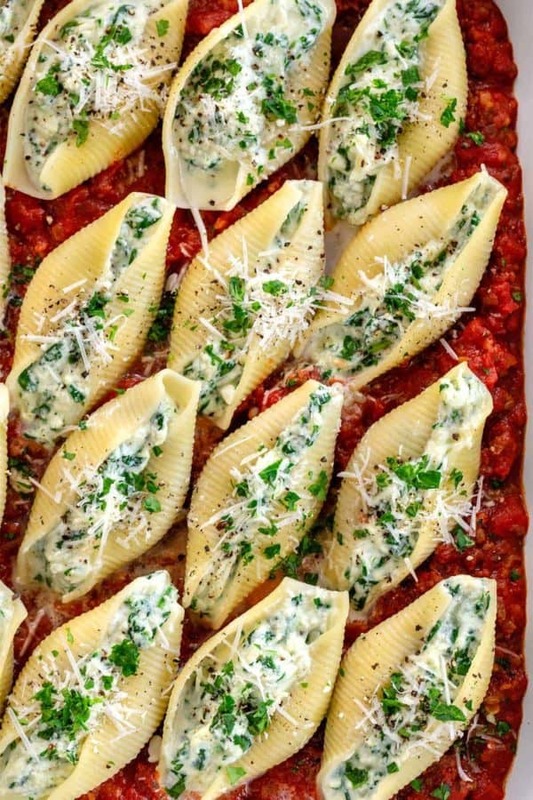 Stuffed shells recipe with spinach and three kinds of cheese! Ricotta, parmesan, and mozzarella pair nicely with a homemade sausage marinara sauce. Heat a large saucepan over medium heat. Add 1 tablespoon olive oil, once hot add sausage. Break meat up into small pieces as it cooks and no longer pink, about 5 minutes. Add onion and garlic to a pan, stir and cook for 2 minutes. Add tomato paste and cook for 1 minute. Add crushed tomatoes, oregano, 3/4 teaspoon salt, and 1/4 teaspoon black pepper, stir well to combine. Increase heat to medium-high and bring sauce to a simmer. Cover the pan, leaving a small opening for steam to escape, and lower the heat to low so that the sauce is simmering. Cook sauce for 15 minutes, stirring occasionally. Add some water if the sauce starts to look dry. Taste sauce and season with salt and pepper. Add meat sauce to a 9x13-inch baking dish, spread evenly in the pan. Set the oven rack to the center position. Preheat oven to 400°F (204ºC) degrees. Bring 3 quarts of water to a boil in a large pot. Cook pasta according to package directions. Drain and place shells on a sheet pan then set aside. Heat a large saute pan over medium heat. Add 1 tablespoon of olive oil, once hot add 2 teaspoons garlic and saute until fragrant but not browned, 30 seconds. Add spinach and cook, occasionally stirring, until the leaves begin to wilt but are still bright green, 3 minutes. Remove from heat and let cool. Stir together cooled spinach, ricotta, mozzarella, Parmesan, egg, parsley, basil, 1 teaspoon salt, 1/2 teaspoon pepper, and nutmeg until thoroughly combined. Transfer cheese filling into a large resealable plastic bag or piping bag. Cut off the edge of the bag and pipe each pasta shell with ricotta mixture, and place in a baking dish. Cover the shells with aluminum foil and bake covered for 30 minutes. Remove the foil and continue cooking until the sauce begins to bubble about 5 minutes. Serve warm with a sprinkling of Parmesan cheese. 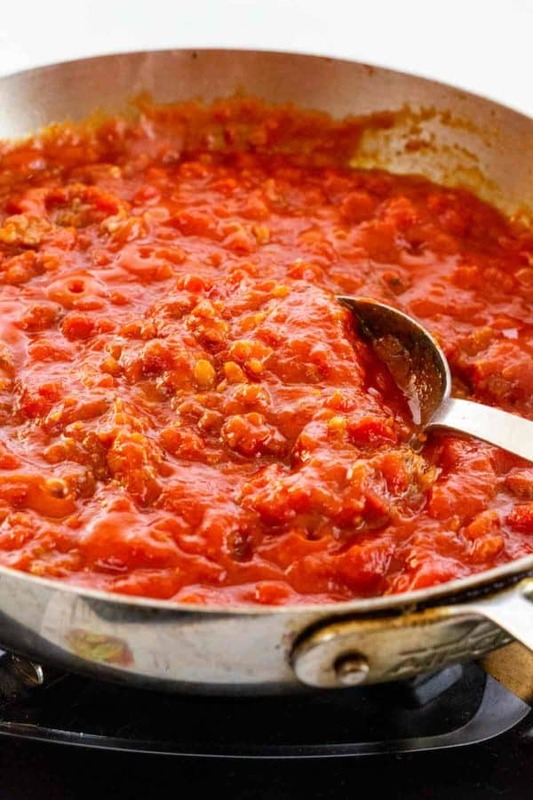 Store-bought tomato sauce can be used, add 3 cups (28 ounces) with the browned sausage and simmer for 15 minutes. Ground chicken, turkey, or beef can be substituted for sausage. MAKE IT LOW-CARB: Instead of pasta shells, use zucchini (thin sheets or boats), small bell peppers, or mushrooms caps (portobello medium or large sizes). I just made this recipe and I followed it exactly except I doubled the recipe and froze half for another night. This is by far my favorite stuffed shells ever!!! Thanks so much for this recipe! Is this enough for 4 people? Hi Christie! Yes, I ate about 3, so 4 a person would be a generous serving. The dish makes 16 stuffed shells. I am hosting a dinner party for 12 next week. Found your recipe today and have decided to make your shells. It will b buffet so I think this is perfect for an uncomplicated self serve dish. A green tossed salad will b perfecto go on the same plate. Thanks so much. Does that this dish freeze well? If so do I freeze it already cooked? Simply stated: this is the best stuffed shelled recipe I’ve ever tried! My daughter and I made it for dinner last night and my whole family loved it, even my spinach-hating husband. The only change we made was using spicy Italian sausage instead of mild and it was delicious. Sauce could even be made separately and served with spaghetti or other pasta dishes. Shells were the perfect texture — not too dense, not too watery. I love the technique of putting the shells on top of the sauce so the sauce doesn’t overwhelm the flavor of the filling. This is a welcome addition to a limited number of dinners all 5 of us will eat with no complaints! Thanks, Jessica! YAY! This comment made my day 🙂 What great feedback, so happy that you and your family enjoyed the meal. Mom win! Can the Marinara meat sauce recipe also be used with ground beef for spaghetti? Yes, you can absolutely use the marinara sauce and brown the ground beef to make spaghetti. I made these for dinner. They turned out excellent. Restaurant grade cuisine. Thank you for your feedback Heide! Well this turned out Delicious! Followed the recipe, but didn’t have tomato paste, so I left it out, and added tomato sauce. Instead of parsley I just doubled the basil. This was beautiful, easy, and so tasty. It was the perfect amount of sauce to shells ratio! Thank you, and I look forward to trying more of your recipes.